The British Telecommunications Phone Box was once an essential part of life. Since the introduction of the mobile phone and it's increasingly popularity over the past two decades, the iconic 'red phone box' is now increasingly under threat. Previous to the mobile phone many had already been replaced with 'vandal proof' characterless boxes that blended in almost unnoticed into their surroundings. British Telecom has disconnected many boxes, removed or abandoned them, or offered them to the community for a token payment. Of those that still have working phones in them most are only available for emergency calls. However more and more communities are recognising the red BT box as an important visually appealing and historic piece of street furniture to be preserved and treasured. A symbol of a by gone age, simpler days before the onset of 24hr personal connectively, availability, and unlimited information on a global basis. This started as a way to pass a dreich day on Skye, but more and more I find myself drawn to these boxes, seeking them out, and now using searching for them as a way of exploring this amazing wee country ah call hame. 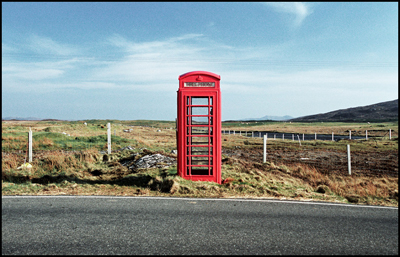 A here you will find a small collection of my growing library of Scottish Red Phone Boxes. Please visit my Red Phone Box Flickr set for the full collection and updates.